When it comes to closet organization everyone has a dirty little secret in their closet. Old clothes, clothes to small, clothes to large and fashion no-no’s. It all resides in our closets. Why do we abuse our closets with useless junk and “one day” outfits? Because when it comes to our closets, it is so easy to just close the door! Closets can be overwhelming depending on the size. But with my step by step instructions we can get through the jungle of your closet together. Depending on the size of your closet this may be practical or overwhelming. So let’s say that your closet is small. You will want to pull everything out in order to have a clean slate to work with. Now, if you have a large closet or a huge walk in closet you will want to start at the back of your closet and work your way out. Take things and clothes out the back of your closet in sections. That way it will not be so overwhelming. Sidebar: Now is a good time to vacuum the closet floor and dust the shelves. What? You think I am going to let you put organized things back into a dirty closet? Not on your life! Step 2: Sort, Purge, Try On! Regardless of the size of your closet or how you started this part will be the same. You should have four boxes that are labeled “toss”, “garage sale”, “charity”, and “another room”. Okay, now you will start sorting into your various boxes what you have pulled out of your closet. This is the time to try on your clothes. See what fits,what doesn’t. Put to the side what you want to keep. We will deal with those things later. Don’t forget to try on shoes also. Ladies (and some Men!) I know how hard shoes are, but take baby steps in this area. Think realisticly about your clothes and shoes. Only 20% of it is worn 80% of the time. If you are 10 years out of highschool and still have clothes that you wore in highschool it is time to get rid of these! Take out any items that don’t belong in your bedroom closet. If you have a item in your closet that needs to stay, but don’t have anywhere else to put it, then it can go back in once you finish step 2. Step 3: Time To Put It Back Together! So you have everything sorted and purged and you have saved only the things you can wear now and love. Great! Pat yourself on the back. The hardest part is behind you and now it is time to put it back together. A Home Basics 6 Hook Over The Door Hanger will help you to keep some of your everyday use items at arms length when getting ready in the morning. A Lynk Closet Doubler is always a good way to get extra space out of small or large closets. When putting things back in work low and go high. This is because you do not want to be trying to put shoes in order up under hanging clothes. Or anything else for that matter. Okay, back to the closet! Once you have what you want at the bottom you can start hanging clothes. Now with hanging clothes you have several options. Some people like to color code their clothes because it is easiest for them to find outfits by color. If you organize your clothes by season, you can put two seasons at a time in your closet and store the other two seasons in a extra closet or basement or a attic in a Organize It All Storage Wardrobe. To organize by type you need to define what types you want to use. Examples of types would be dresses, skirts, short sleeves, long sleeves, pants, suits,and cotton or silk,etc. This method is extremely helpful when picking out outfits. You also have the option of using some or all of the above. Whatever works for you is the point. So experiment and see what works. Okay, once clothes are hanged, you need to continue putting things away on the topshelf. Use the topshelf for out of season items or items not used often. And don’t forget Fresh Cedar Rings for Hangers to keep your closet smelling fresh and the moths out! Once you have finished putting everything back in your closet sit back and relax! Whether it took you five hours or five days be proud of your accomplishment. Enjoy your newly organized closet. But, remember that up keep is half the battle. Spend five minutes a day making sure that everything is where it should be. Pick up the clothes, put up the purses, shoes, and ties. Put the dirty clothes in the hamper. 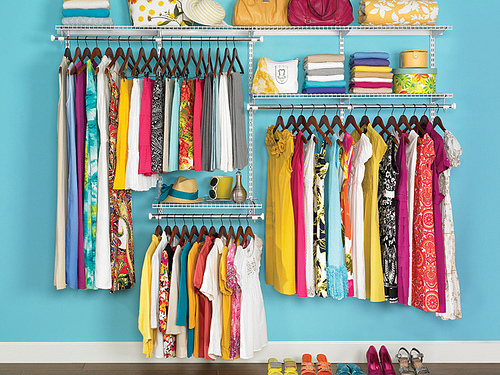 Just remeber – it is easier to do five minutes maintenance than to organize the entire closet! This post originally appeared on our sister site Help-Organize-Life.com. Contains affiliate links. Why Do We Keep What We Keep? The other day as I was driving by the old place where I use to vote and I thought about the new voter card that I had received. When you get a new card they ask you to destroy the old card. Well I was finding myself not wanting to destroy the old card but to keep it. But for what? As some monument to a moment in my life? As a reminder of where I used to vote? I had no idea. There was no real reason, but I found it comforting to want to keep this item. This one example is played out on a larger scale by many people everyday. It got me to asking why do we keep what we keep? There are certain things that I have kept in my life when I had gotten a replacement for it. My reasoning was for a visual reminder of a time in my life. But at some point you really need to ask yourself is this really necessary. Am I the only one who cares about this information and if so do I really need to keep the item. If I was to start to keeping everything I got a replacement for I would become a hoarder and being an professional organizer I don’t think that would be a good idea. So I got to thinking about what I could do instead of keeping this item and here is what I came up with. It may help you too! Take a picture! If it is so important for you to keep an item then I would suggest that you take a picture of the item that you are thinking about keeping and that way you can just discard it but have a reminder about this time in your life. It is so much easier than keeping a whole bunch of clutter just to remember a time in your life. Get over it! That’s right, get over it. You know that you are the only one who cares about it and there is no real good reason to keep it. Sometimes you have to be that bold about it to yourself. 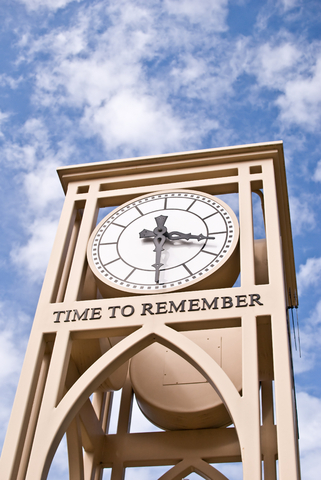 Set a limit of just keeping a set number a year of very important items that you want to remember in a memory box. This is for the person who just must keep the physical item and pictures just won’t do. These are just a few things that you can do to keep from becoming a hoarder of objects to remember when. I am sure there are more and I would love to hear how you keep from doing this or if you do this how you keep it under control. Leave your stories in the comments below. Until next time…. I was looking at QVC today and I came across this wonderful product. I always have clients who want a better way to organize shoes, purses, whatever in their closets. Well, when I saw this item I had to let everyone know about this. This Carousel Closet organizer has so many possibilities. You can organize shoes and purses, or belts and undergarments, or toys and art work. You name it and I believe you can organize it in this “spinning” garment rack. And it is collapsible for easy storage when not in use. I do not know how many they keep in stock but you need to get your hands on this one if you are looking for a great way to organize your closet. Happy Organizing. Looking for tips on organizing your closet. This video does a great job of giving you tips to having an organized closet plus a financial tip to boot!